Modems in the cloud are now a reality. The VOCAL SAMS is a solution for inter-operating with legacy modems without the need for modem banks with E1/T1 connections. The ever more rapid advancement and adaptation of new technologies has left a gap in legacy communications systems. E1/T1 lines are increasingly being replaced by Ethernet based VoIP systems, companies are often left with modem based technology that can no longer work within the new infrastructure, but remain necessary for daily business. Even when traditional ISDN and POTS lines remain available (often at a premium) Remote Access Server (RAS) equipment like the AS5350 has reached End of Support from Original Equipment Manufacturers and these vital business systems are left in a state where failure is imminent and quick repair or replacement are no longer options. This can happen with servers interacting with point of sale devices, meters, alarm systems and numerous industrial controllers. Countless M2M applications rely on data modems to accomplish their task. VOCAL has a number of solutions to allow these applications to adapt to the changing infrastructure. 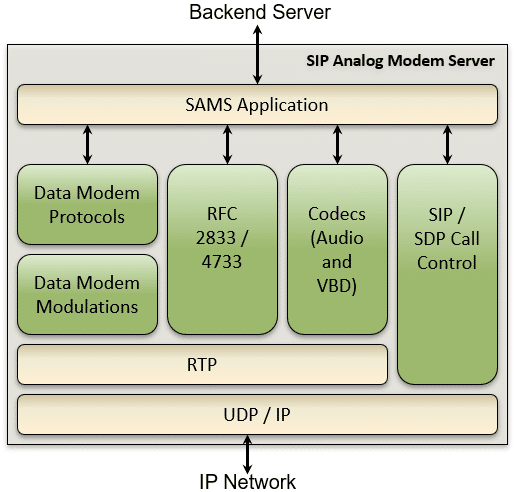 The VOCAL SIP Analog Modem Server, or SAMS is the centerpiece of these solutions. This Virtual Modem Server allows a business to deploy a server in the cloud, which can work with the modern VoIP phone network infrastructure based on SIP and RTP, instead of necessitating T1/E1 lines to connect to the PSTN. The Virtual Modem server contains true soft-modems, not just an AT command set on a TCP socket pretending to be a modem. This allows the server to connect to true voice band modems deployed on the PSTN, and thus does not require installation of additional equipment on the far end of the system. 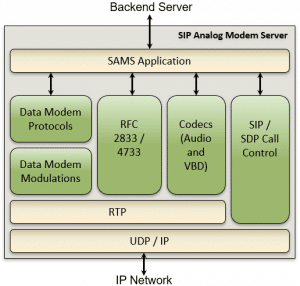 SAMS provides a true Modem over IP (MoIP) solution. VOCAL has server configurations supporting a broad range of modems. And because VOCAL has supplied the modem code for the RAS servers of the analog telephony world, you know that the modems are industrial grade. VOCAL servers come in a variety of configurations which cover the full range of ITU V-series modems as well as many other industry standard modulations. The server is controlled by industry standard AT commands via standard tty nodes and com ports in the server filesystem – just as if it were a box-modem on a serial connection. This allows it to easily fit into currently existing systems. Many other configurations and methods of control are available in order to flexibly meet the needs of already deployed infrastructure and applications. In addition, VOCAL can customize or build to suit, in order to meet very specific system requirements. TCP Originate – Used in environments where the modem is being used as a transport medium to connect to a back end server for further processing. This option is particularly useful with services like transaction/point of sale processing.